Legendary rockers the Rolling Stones are ready to yell "Start Me Up" one more time. The band landed in a blimp at a New York press conference Tuesday to announce their latest tour, which comes near the 40th anniversary of the band's first show. Lead singer Mick Jagger, guitarists Keith Richards and Ron Wood and drummer Charlie Watts alit in a yellow blimp emblazoned with the Stones' lips and tongue logo. The band said their 2002-2003 world trek would play stadiums, arenas and small clubs. On previous tours, the Stones played small venues but those gigs were impromptu events with the public receiving little notice before the show. The group's first tour in three years coincides with the Stones' first public performance on July 12, 1962 in London's Marquee Club -- but don't call it a 40th anniversary tour. 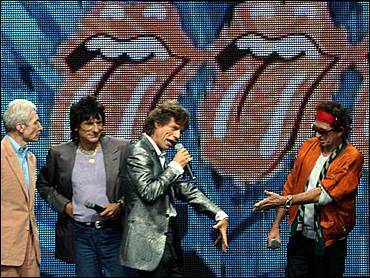 Members of the Stones' camp say the group is "only 39" since Watts did not join until 1963. Jagger told the news conference that the group would be releasing a double CD greatest hits collection which will also include new material from the band. Asked what the motivation was for going out on the road again, Richards said: "Fun." Jagger said many well known Stones songs would be on the play list for the tour but, as always, the band also intends to play rarely performed material. "It's nice to find ones we've never done before, so we're always looking for those," he said. Said Richards: "We're open to suggestions." The tour will begin on Sept. 5 at CMGI Field, a new football stadium outside Boston. The North American leg will cover 32 dates before ending in Mexico City in February. The tour will rev up again in June 2003 as the band journeys to Europe, Australia and the Far East, including what the group hopes will be their first show in China. Jagger said that opening acts booked so far include Sheryl Crow and No Doubt with others to be announced at a later date.